The marketing program designed for you. We know you’re busy! “MMB!” is a business and organization marketing program. It’s built around one-to-one+ monthly review meetings with a technical design specialist focused on your interests and needs. We help you tailor your marketing with your websites SEO and User Interface related content to increase connection and engagement. 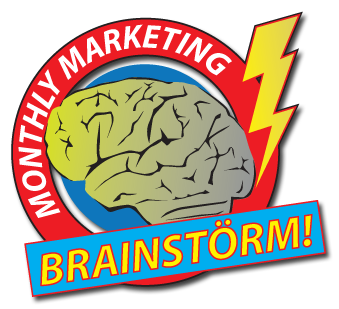 Contact us and we'll see how well the Monthly Marketing BrainStörm can serve your group! We have three tiers of this package available starting at only $75 per month. Packages all include our SH-1d web hosting platform (website, 10 email accounts, unlimited mail forwards). There are more advanced programs ranging from $125/mo+. All packages include the same three key components: Statistical Review, Monthly BrainStörm Meeting and a set of content updates. If you have questions or are seeking to implement your own Monthly Marketing BrainStörm let us know today.